Yesterday One America News posted an article about President Trump’s shutting down of the Voter Integrity Commission. There is no question that we do have a problem with voter fraud–it is a problem we have traditionally had (Chicago?). The question is how much voter fraud is there and what can we do to combat it. One of the problems is the fact that all states are not updating their voter registration lists on a regular basis. Last year a friend of mine checked the voter rolls and found that there were three voters registered at her address who did not live there. When she approached the Board of Elections, she was told that she did not have the authority to remove those people from the voter rolls. Hopefully there is a procedure to verify the information and remove them, but her word was not enough. Heritage Foundation’s Hans von Spakovsky says that members received an email only shortly before the president signed the Executive Order to end the commission. Von Spakovsky says the demise of the commission can be attributed to two reasons– the refusal of some states to share voter registration information and litigation. “We’ve had almost a dozen lawsuits filed against the commission, all of them frivolous. And those lawsuits were intended to keep us from being able to work and unfortunately they were successful,” said the former commission member. According to von Spakovsky, commission members spent nearly 100% of their time fighting litigation rather than investigating voter integrity. “It basically became impossible for us to do the work we were intended to do,” added Von Spakovsky. Members of the panel also suffered personal attacks. Von Spakovsky was accused of sending an email to the Department of Justice requesting that “democrats” not be allowed to serve on the panel. However, the Heritage Foundation fellow refutes that claim saying that he had expressed concerns about democrats joining the panel in a private email months before he himself joined the panel. That individual forwarded the email to the DOJ. Von Spakovsky said that his concern was that democrats would join the panel to sabotage its work–a prediction that proved true according to von Spakovsky. “One of the democratic members, Matt Dunlap- he’s the Secretary of State of Maine- actually filed a lawsuit against the commission as a member. Again, making all kinds of frivolous claims. And it was lawsuits like that that made it practically impossible for us to work,” said von Spakovsky. One wonders why anyone would want to block a commission to ensure the integrity of America’s elections. Trump signed an executive order abolishing the panel and turning the matter over to the Department of Homeland Security. However, von Spakovsky is concerned DHS will focus solely on cyber security attacks rather than addressing illegal immigrants that may be voting and those people are registered and voting in more than one state. The ending of this commission illustrates the difference in how the government works and how a businessman thinks. As Ronald Reagan said, “A government bureau is the nearest thing to eternal life we’ll ever see on this earth.” A businessman ends a program if it isn’t working. Obviously we need more businessmen in our government. The Daily Signal posted an article today about the President’s election commission that is investigating voter fraud. Many of the states refusing to cooperate with President Donald Trump’s election commission aren’t in compliance with federal law on maintaining voter registration lists, according to government watchdog groups. So far, 18 states and the District of Columbia have declined or are still considering whether to provide election data to the Presidential Advisory Commission on Election Integrity, established in May to examine and prevent voter fraud, among other concerns. The commission requested voter registration data from every state and the District and 14 states include counties where registered voters outnumbered eligible voters based on Census Bureau data, according to findings from Judicial Watch, a conservative legal group. The 1993 ‘motor voter law‘ requires states to purge their voter rolls of ineligible voters periodically. “Overall, in most of the states not providing information to the commission, there are a significant number of counties with problems,” Robert Popper, senior attorney for Judicial Watch’s Election Integrity Project, told The Daily Signal. Common sense tells us that if registered voters outnumber eligible voters in a county, there is a problem. Every fraudulent vote cast in an elections voids the vote of a legitimate voter. That is the true definition of voter suppression and needs to be stopped. Yesterday was spend working the polls (and unfortunately getting a sunburn). Some of the candidates I supported won, and some lost. However, I learned a few things. If the American voter really wants to get rid of the political class, there are three steps they can take that will get results. It will take a year or two, but it can be done. The first obvious step is to get informed. You need to know when you are being lied to. Until we have informed voters, we will have a political class. When people begin to pay attention two weeks before an election, a lot of what they hear is simply distorted or not true. There was a situation locally where a candidate’s party affiliation and ethnic background were misrepresented in a flyer aimed to get the votes of a particular ethnic group. Because the lies were believed, the man got the votes. The voters involved were not informed enough to know that they had been lied to. It will be interesting to see what happens if they ever meet the man. First hand information is always the best, and since change will begin at the local level, being locally informed is fairly easy. Go to the meetings of the various official boards in your community. If you can’t go, talk to the people who do go. Don’t believe everything you read in your local paper or hear on the news–investigate for yourself. The second step is to share your knowledge with your friends. Your immediate circle of friends may not be as informed as you are, and there is nothing wrong with telling them the things you have learned. I had a number of friends come to me with questions about the primary election, particularly the state offices that are somewhat under the radar. I had information that was useful to them and in one case changed someone’s idea of how to vote on a particular issue. The third step, which I saw in action yesterday, is the most effective. There were a few private citizens at my precinct handing out information about the conservative candidates. In that precinct, all those candidates won. It is possible that all my neighbors think like I do, but I find that highly unlikely (and not necessarily a good thing). It is also possible that many of my neighbors went to vote for President and saw a bunch of other offices on the ballot that they had not planned to vote for. Those that wanted conservative candidates had the information in their hand about the candidates, and the voters looked at their papers and voted accordingly. Those voters who did not want conservative candidates also had the information–they simply voted for the people not marked as conservative. If you are happy with the political class continuing to grow the government and demand more of your money, then there is no reason to get involved or informed–they will continue to run things until the voters stand up and say ‘no.’ If you are ready for change, the three steps above will bring change. The Washington Free Beacon posted a story yesterday about a group of people who are getting serious about voter fraud. A public interest law firm has threatened to bring lawsuits against more than 30 counties across the United States that have either more registered voters than eligible citizens, or a number of registrants that is implausibly high, the second such wave of notice letters sent by the group to various counties. Unfortunately voter fraud is a problem. Every fraudulent vote cancels out the vote of a legal voter. 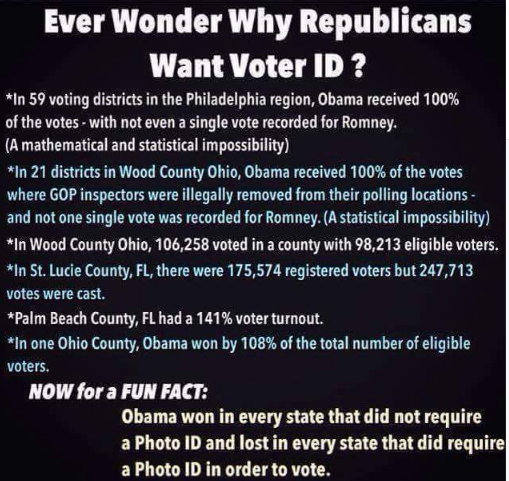 Voter fraud is something that impacts all American,s and we all need to work toward ending it. According to the foundation, five counties in Colorado, seven in Florida, two in Nevada, 12 in North Carolina, six in Pennsylvania, and five in Virginia show a substantially high number of registrants and will receive the warning from the group. The foundation sent notice letters in August to 141 counties across 21 states, including counties in Michigan (24 counties), Kentucky (18), Illinois (17), Indiana (11), Alabama (10), Colorado (10), Texas (9), Nebraska (7), New Mexico (5), South Dakota (5), Kansas (4), Mississippi (4), Louisiana (3), West Virginia (3), Georgia (2), Iowa (2), Montana (2), and North Carolina (2), as well as Arizona, Missouri, and New York (1 each). The foundation discovered that some counties showed voter registration rates that exceed 150 percent during its first investigation into voter rolls. The foundation has since filed litigation against two of the counties that received the letters in August. I am grateful for the work this foundation is doing, but I am saddened by the fact that the states and countries are not following the law. Yesterday The American Thinker posted an article about a recent decision by the Supreme Court not to hear a case regarding proof of citizenship for voter registration. In a commonsense decision, the Supreme Court refused to hear an appeal of a case that decided that people registering to vote in federal election don’t have to prove their citizenship. That means that people registering to vote won’t be bullied into proving citizenship, which now seems to be an irrelevant criterion for voting. It would have been nice if the Supreme Court had ruled on this; however, there is an interesting consequence of this decision that will give Kansas a more honest election on the state and local level. On Monday, Roll Call posted an article explaining how the decision of the Supreme Court not to take the case would impact elections in Kansas and Arizona. Basically that means that each state can set the standard for who is allowed to vote. Obviously, because there is a federal form people can use in Kansas, there is a way of circumventing that law by using the federal form. However, using the federal form only allows people to vote in federal elections. This is another example of the federal government overriding the 10th Amendment of the U.S. Constitution. I really wonder who came up with the bright idea that non-citizens would be able to vote in American elections. That is totally ridiculous and seriously undermines the integrity of our election process.